At Emerson Bearing we are fully dedicated to our customers, and take pride in making outstanding products as well as providing accurate documentation of their performance. Our bearings are engineered and manufactured with the highest levels of precision, and uphold the highest quality standards, however, no bearing lasts forever. So how can you be sure that your bearing will perform well throughout its life? Rolling element bearings are known for being extremely reliable, and many even outlive the machines on which they are installed. However, several factors can shorten a rolling element bearing’s life, and load and speed are the most common causes for early failure. A load that exceeds the bearing specification can accelerate fatigue, shorten its life up to a factor of 8-10, and a speed exceeding the veering specifications can also dramatically decrease a bearing life. Other factors like extreme temperatures, vibrations, and dirt or contaminants play an important part in a bearing’s life. Emerson Bearing is here to help you get the most out of your bearings. 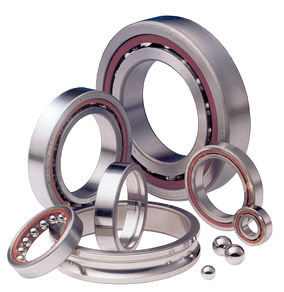 For years our experienced team has been providing high quality bearings across a large span of different industries. Consult with us, and we’ll make sure your bearing lives a long, full, productive life. For more information on which kind of bearing is best for you, visit our Catalog and Technical Toolbox web pages.